The Times of India (ToI) has launched a campaign, #Lost Votes, conceptualised and created by J Walter Thompson. Readers expect daily newspapers to highlight issues that bring about a positive change in their lives. The campaign highlights one such cause; it calls for a policy and electoral reforms to make the vote of the Indian migrant count in the country’s general elections. The 2019 general elections are on the anvil and ToI took up the challenge to launch a nationwide campaign to generate a conversation and make a difference. Countless Indians are on the move for work or education or marriage. So do our bank accounts, which automatically travel with us. And also our mobile and PAN and Aadhaar numbers. Perhaps the only thing that doesn’t move is our right to vote. It’s tied to the place where the person’s name is registered in, tied down by a rule that subtracts crores of Indians from our country’s democratic equation. It’s time to change this. It’s time to turn these lost votes into votes that count. Because they can shape the destiny of our nation. A simple but powerful and noble idea, ‘Lost Votes’ has the potential to positively impact our democracy, resonating with TOIs philosophy of ‘Change Begins Here’. The campaign hopes to strongly represent the voice of crores of Indians whose votes are lost due to (short-term or immediate) migration within the country. “The idea of the film is to evoke the voice of the lost vote. A voice that amplifies the angst and echoes the emotion of over 20 crore Indians losing their vote. To play the voice of the lost votes on loud speakers and yet feel the voice being drowned by the distance, lost in the middle-class multitudes out there. Losing your right to vote is like that fading homing signal. It’s like missing the last train home and losing the hope of making a difference in your hometown from your distant work station. 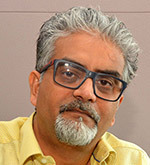 Mera Haq Kahin Pe Kho Gaya,” said Senthil Kumar, Chief Creative Officer, J. Walter Thompson. “When we started working on the Lost Votes campaign, I knew the film had to be poignant and soul-stirring. It needed to capture that ineffable feeling of being a stranger in a strange land. One who has to deal with the pain of not just losing touch with his roots but also not mattering in the larger scheme of things, because he/she is unable to vote (despite having the right to.) Whether you’re a face in the crowd or the crowd itself, nobody is immune from this pain. The ‘Lost’ poster-frame is meant to be symbolic of this feeling of becoming insignificant,” added Sambit Mohanty, National Creative Director, J Walter Thompson.